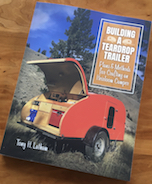 Teardrops n Tiny Travel Trailers • View topic - Battery hogs how do you deal withem ideas? Re: Battery hogs how do you deal withem ideas? slowcowboy wrote: Tony what if i ever wanted to take my tear ice fishing perhadpe..what would heat my camper all night long...which I amit for summer camping isn't nessary just like you say a hour before bed and when i get up..slow. Then you should wear you long-johns and leave your spurs behind. If the heater ran continuously, it'd draw about 35 amps. A Group 27 marine battery would handle that just fine for one night. But since it produces 5,000 watts it would probably run less than a third of the time in a teardrop. Sparksalot wrote: Slow, how many watts is the heater you're talking about? This is what Slow is getting info on if it is a batery killer or not. Gotcha, I was thinking resistance heating for some reason. You're probably only going to use fifteen or so amps in a night. There's no way those heaters will run down a Group 24 or Group 27 in a teardrop as long as the battery is healthy. Running your truck all night to heat your teardrop doesn't sound like the top of the heap of ideas to me. I'd lay there all night listening to the engine while worrying about a coolant leak that is going to cause my engine to overheat and seize. Kinda like listening to hobbled pack stock all frigging night when you're thirty miles from the horse trailer. Or...remember, you're camping. Get rid of any cotton clothing, wear wool or synthetics. Eat a good meal. Spend some money on getting a good mountaineering quality sleeping bag...don't wear spurs to sleep! Wear a balaclava. Get a couple of dogs as heaters. How cold is the air when you're out? Not wind chill...air temp? This is an Espar heater after which the Chinese heaters are fashioned and they do not draw a great deal of current. And Mike the word you used is a pejorative right up there with the N word.